I have written quite a few posts dealing with the different size requirements of some products. Some products have a minimum length, and/or a minimum diameter, while others may have a maximum diameter as part of their US Grade requirements. But what about uniformity? Let’s face it, that is a big complaint that many receivers have, regarding some product being received in their warehouse. Everyone wants the product to be uniform in the containers, all items being of relatively the same size. Take a look at the image above. 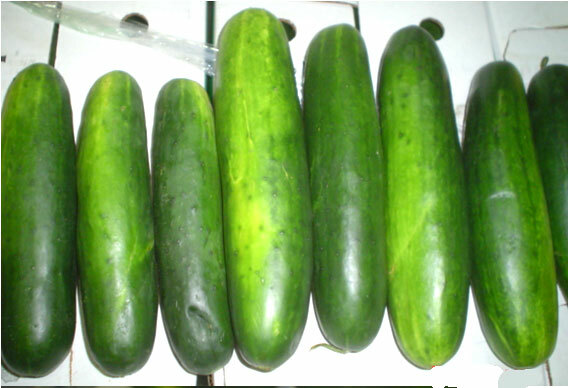 Although the cucumbers all have the same color attributes, they are obviously not uniform in size, with large ranges in length and in diameter. Do these cucumbers make the size requirements for the U.S. No. 1 Grade? As long as the cucumbers are at least 6 inches in length and not greater than 2-3/8 inches in diameter, they meet the requirement. In fact half the cucumbers could be 6 to 7 inch and length and the others could be 9 to 11 inches in length, and they would meet the requirement of U.S. No. 1. Now is that good for the receiver and good for the grower? Of course not. The retailers want to display their product and let the customers choose their items. Having a display of different sizes only aggravates the customer, as they are looking for uniformity in their selections. Aggravated customers will buy elsewhere. 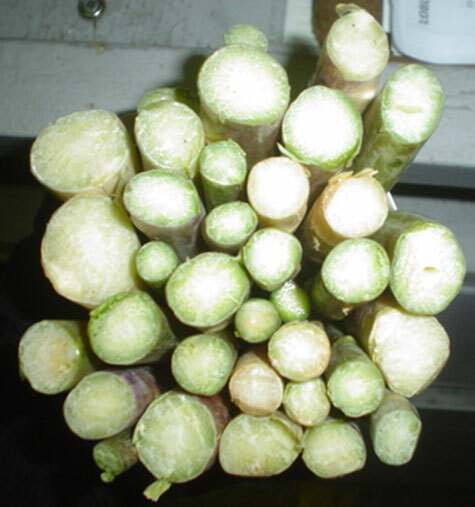 Again, the asparagus looks fresh, looks good, but the various sizes detract from their appearance. 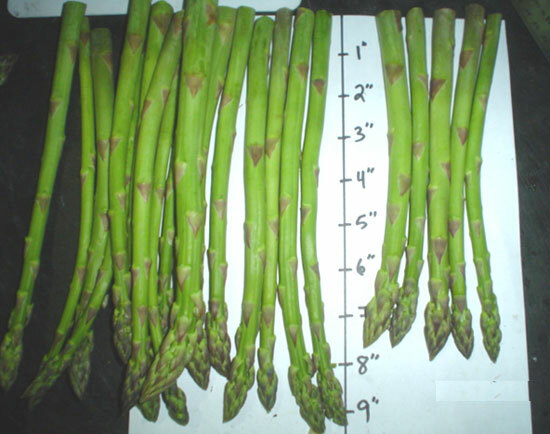 Does this asparagus meet the size requirements for U.S. No 1? Yes, unless otherwise specified, the spears are required to have a minimum diameter of 1/2 inch. Meaning, there is no length requirement, and there is no maximum diameter. Do any products have requirements for uniformity? There are a few. If you read their USDA Inspection Instructions some products have to meet the requirement of being fairly uniform. Unfortunately the definition of fairly uniform varies from commodity to commodity. For example, their is no uniformity requirement for apples in bags. But for apples packed in tray-pack cartons, they must be fairly uniform, meaning the smallest apple does not vary more that 1/2 inch in diameter from the largest apple in the container. For peaches, the definition of fairly uniform is more convoluted. For peaches packed 45 or less to a carton, they cannot vary by more than 1/2 inch, but for peaches packed 80 or more to a carton they cannot vary more than 1/4 inch in diameter from the smallest peach to the largest peach. So what do you do? The bottom line, if you are the packer, your customers are looking for a uniformly sized pack. Don’t pack a jumble pack of different sizes and expect repeat sales. If you are a receiver, you can take some steps to demand uniformity from your suppliers. By adding your own company specifications to your orders you can establish your own minimum and maximum lengths and minimum and maximum diameters. Your suppliers would have to meet your specifications or face rejection. This practice is becoming much more common-place within the industry. This post is filed under Inspection News/Comments.